You would never perform a procedure without any ability to monitor your patient’s health. So why would you run your practice on a network without the ability to monitor its health? That’s where Arevtech can help. Our experienced IT Managed Services offers 24×7 network monitoring, giving you peace of mind knowing that Arevtech has deep insight into your network. This allows us to keep your critical systems and network up and running, secure your vital data, and address IT issues before they become real problems. Arevtech [formerly AMI] has years of experience helping dental and medical practices release their true potential by eliminating IT related worries. Our team of experts provides friendly, knowledgeable IT service to help you build and grow a streamlined, productive practice while enabling you to stay focused on providing top quality patient care. 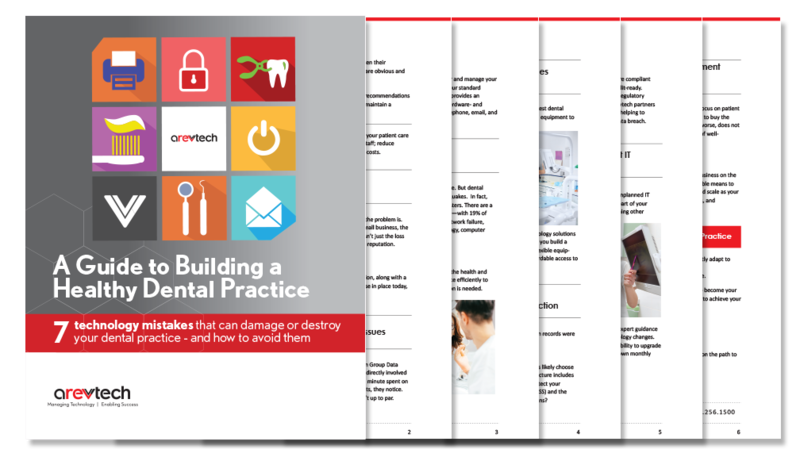 Sheets, Paquette & Wu Dental Practice found that their once leading‐edge IT environment (and its break/fix support services) was rapidly becoming outdated. They realized they needed a more modern IT approach that would be better aligned to meet their high levels of expertise and commitment to excellence in patient care. Arevtech was brought in to perform a review and assessment of their challenges and needs – and implement an IT action plan that would bring their practice up to a leading edge level of IT infrastructure. Arevtech also implemented IT managed services for proactive monitoring and maintenance of their systems along with comprehensive technical support services. Sheets, Paquette & Wu Dental Practice now has a greatly reduced risk of practice disruption. In less than one year they saw dramatic reduction in the number of IT support calls and time spent troubleshooting computer problems. Arevtech now provides 24/7 monitoring and management – allowing issues to be proactively identified and remediated before any disruption to the practice takes place. Read Sheets, Paquette & Wu Dental Practice Success Story here.